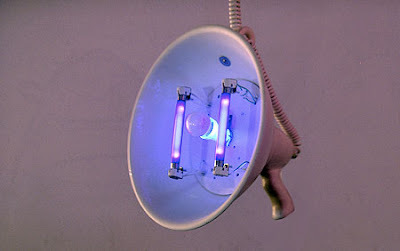 Designed by Dana Gordon, this lamp switches between two modes according to its position, regular white light or UV light which exposes the personal graffiti on the walls. 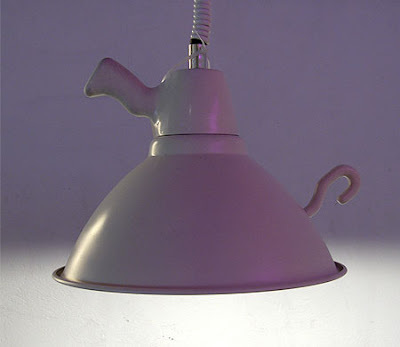 The KGB lamp was part of the IDII exhibition in Salone del Mobile 2006 (designed with Alejandro Zamudio). I like the contextual integration of the used technology. Usually UV lighting is used to make things "appear" on a picture, or other fun applications seen on fabric. What I love about this project is the use of UV light within a context that marries the interrogation setup to the revelation, this offered by a specific technology.